ACF Culinary Team USA Places Fourth in the World at International "Culinary Olympics"
ST. AUGUSTINE, FL--(Marketwired - November 01, 2016) - American Culinary Federation (ACF) Culinary National Team USA ranked fourth in the world overall and won two gold medals in the 24th Internationale Kochkunst Ausstellung (IKA) International Culinary Exhibition, commonly known as the "culinary Olympics," Oct. 22-25, in Erfurt, Germany. Two of the ACF Culinary USA teams -- national and youth -- finished in the top 10, while the military team won four gold medals and two bronze medals, proving American cuisine is among the best in the world. "The teams did a phenomenal job," said American Culinary Federation Education Foundation Chairman Michael Ty, CEC, AAC. "I've been to several 'culinary Olympics' and this one topped them all from the starters to the desserts. These teams put their hearts and souls into it, and they represented the best of American cuisine." ACF National President Thomas Macrina, CEC, CCA, AAC, who was the business manager for the 2012 ACF Culinary National Team USA, knows firsthand the challenges of competing internationally. "The national team displayed impeccable calm and courage under intense pressure," he said. "They competed against the best chefs in the world and their coaching, discipline, teamwork and dedication to the craft is what earned the national team gold medals. The youth and military teams showed exceptional skill, and I couldn't be more proud." ACF Culinary National Team USA's interpretation of current American cuisine trends using American products earned the team gold medals in both cold-food presentation and the hot-food kitchen. The team placed fourth overall in the world among 30 national teams that competed. Singapore, Finland and Switzerland placed first, second and third, respectively. "The team did a great job in overcoming the obstacles that come with competing internationally and the end result proved that," said National Team USA Manager Joseph Leonardi, CEC. "We chose to prepare food that represents who we are as a country, food that we are proud of and is bountiful in America. It has been an honor to serve with this team." ACF Culinary Youth Team USA, all 25 years or younger, showed exceptional teamwork, vision and professionalism. The team was awarded silver medals for its edible buffet and hot-food kitchen. Overall, the youth team placed seventh out of 19 competing countries. Sweden, Switzerland and Norway placed first, second and third, respectively. "This team has been training hard for years and when they got into that kitchen they proved they were ready to cook and never lost focus," said Stafford DeCambra, CEC, CCE, CCA, AAC, youth team manager. "In both the hot-food kitchen and the edible buffet, we showcased a fall seasonal menu that represented the best of American regional cuisine." The military team, U.S. Army Culinary Arts Team (USACAT), earned four gold medals and one bronze in the regional cold-food competition ranking 18th out of 52 countries. Stockholm Culinary Team, Skåne Kulinar and Amber Alliance placed first, second and third, respectively. In addition, the team received a bronze medal in catering, earning 12th place out of 19 countries. Finland earned the top catering spot, followed by Sweden and Denmark, respectively. Staff Sgt. Justin Gonzalez, CC, U.S. Army, Washington, D.C.
Sgt. Joseph Hale, CCC, U.S. Marine Corps, Washington, D.C.
"The team prepared food at a high quality and successfully pushed through every hurdle," said Chief Warrant Officer 3 J.D. Ward, CEC, USACAT manager. "The team outpaced their practice times and worked together to serve a seasonal menu that received a lot of positive feedback." More than 2,000 chefs representing 59 nations participated in the IKA team and individual competitions. To learn more about the competition and how to support the U.S. teams, please visit the ACF Culinary Team USA website. Editor's Note: For additional high-resolution photos, menus or to schedule an interview with a team member, please contact Stacy Gammill at (904) 484-0213 or sgammill@acfchefs.net. 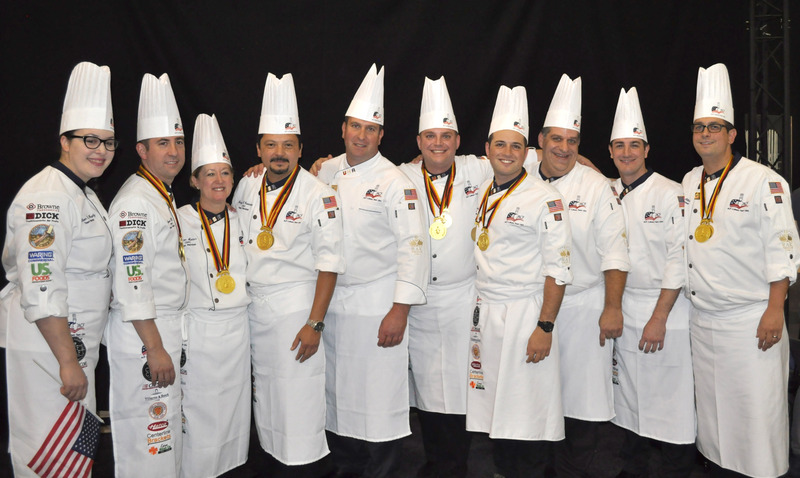 The American Culinary Federation Culinary National Team USA earned two gold medals to place fourth in the world overall among 30 competing nations at the international "culinary Olympics." 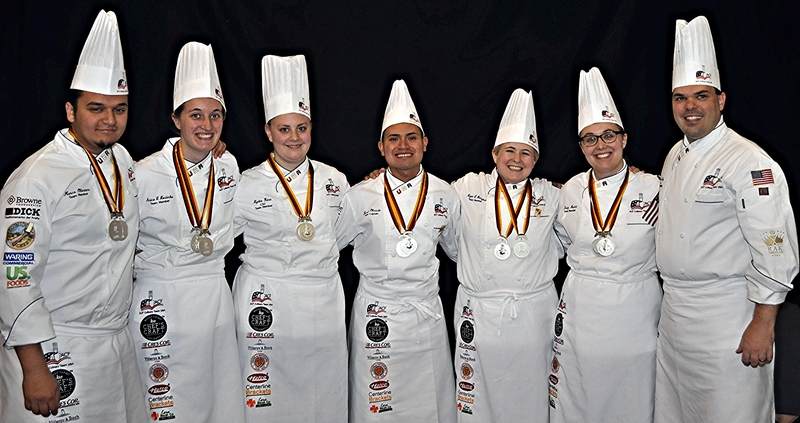 The American Culinary Federation Culinary Youth Team USA earned two silver medals to place seventh in the world overall out of 19 competing nations at the international "culinary Olympics." 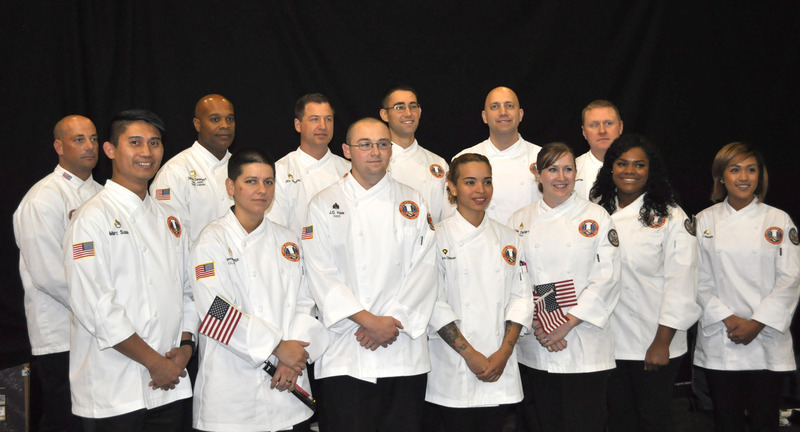 The United States Army Culinary Arts Team earned four gold medals and one bronze medal in the cold-food competition, and a bronze medal in the community catering competition at the international "culinary Olympics."